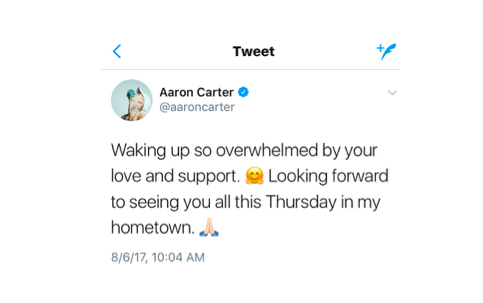 Last weekend, Aaron Carter took to Twitter to post an emotional letter he wrote to his fans regarding his bisexuality – a topic he chose to publicly address for the first time. The 29-year-old pop singer realized that he had strong feelings for both the female and male sexes at the age of 13, but he revealed that it wasn’t until he was 17 that he had his first experience with a male. Although this form of self-realization isn’t easy for anyone, Carter admitted to finding refuge in his music – something he likes to call his “safe haven.” He went on the claim, “The ultimate goal for me is to be satisfied. I never want to be a figure of disappointment,” however, trouble and hardship seem to follow the singer’s life. In 2009, Carter developed a heavy addiction to Xanax, an anti-anxiety drug, while appearing on Dancing with the Stars, and in 2013, he filed for bankruptcy due to financial burdens that arose from his young teenage years. Most recently, Carter was arrested last month in Georgia and was charged with a DUI, possession of marijuana under one ounce and possession of drug-related objects. Yet, it appears as if Carter is in a better place now more than ever. In the midst of the “I Want Candy” artist’s effort to speak out, it was also revealed that he had broken up with his girlfriend of one year, Madison Parker. In an interview with The Bert Show that aired on Wednesday (8/9/17), Carter admitted that “turmoil” and “personal issues” within his relationship with Parker played a significant role in his decision to come out. He explained that when he chose to open up to his then-girlfriend about his sexuality “she didn’t really understand and she didn’t want to,” so, they decided to part ways and leave on mutual terms. Carter is currently single, looking forward to the future, and standing firmly on the fact that it is only his decision whether he chooses to be with a woman or a man. Since his heartfelt confession, Carter’s fans have shown nothing but eternal love for the singer as his tweet has received over 32,000 likes and 6,700 retweets - a response that has blown Carter away. FreedomTwoLove wholeheartedly joins his fans in their continuous outpour of support. It is always a joyous occasion when one is bold and courageous enough to openly accept themselves for who they truly are. As Aaron centers his focus back on music, take a moment to check out his amazing "Sooner or Later" single from his latest EP below.